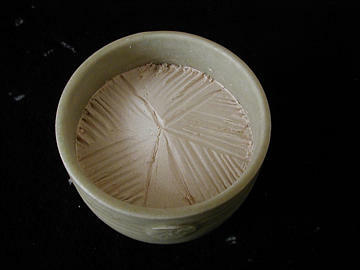 The first step in preparation is filling the Incense Cup (Kiki-gouro) with rice chaff ash (kouro-bai). Fill loosely and do not compact. 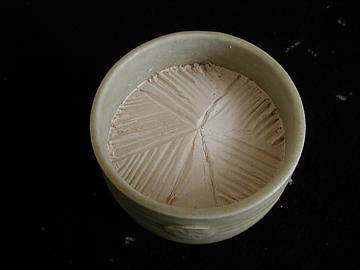 Next the ash (kouro-bai) is stirred with the chopsticks using a clockwise motion. Fluffing the ash in this manner allows oxygen for the charcoal to burn properly. After preparing the ash, use the metal chopsticks to make a hole in the center for the charcoal (Kou-tadon). You only need to make the hole about two centimeters (2 cm.) deep because the ash is loose and the charcoal can be pressed down to the proper height. One very important part of preparing the Kodo cup (Kiki-gouro) is heating the charcoal properly. If has not burned long enough before you put it in the Kodo cup, it will have an unpleasant aroma which will be retained in the ash and affect the presentation. For this reason, the charcoal is ignited and placed in a separate censor until it is glowing red in the center and white on the entire outside. In this manner, any offensive odors are burned away. Now you place the charcoal in the "Kiki-gouro" (Kodo cup) and you are ready to begin covering the charcoal with ash and building your ash mound. note: Normally the charcoal would be white. We used unlit charcoal for this demonstration so you could see it clearly. Next you take the metal chopsticks and make a mound over the charcoal, working from the edge with a counter-clockwise upwards motion. This keeps the ash loose for a better burning of the charcoal. This is a very important part of the process. You want to lightly tamp the surface without compacting the ash below the surface, Remember, the charcoal needs air to burn properly. Hold the ash press parallel to your shoulders and lightly press the surface as you rotate the cup counter clockwise. Keep the ash tamper (Haioshi) 90 degrees to the front of the Kiki-gouro. Shin-kouro or Shin-bai (True pattern) is the most formal. It is divided into five sections called Gou, and the listening line Kiki-suji. An odd number of lines, (kosuji) usually nine, divide the five sections (gou). In the photos below, left is the positive (You)"True Ash" (Shin-bai) pattern of the Oie school and right is the negative or "In" pattern. Notice how the kosuji reverse in the negative pattern. The second more formal pattern is called the Gyou-kouro or Gyou-bai patten. It also contains five sections (gou) and the listening line (kiki-suji) but the kosuji are left out. (see below) Gyou means "Journey" or "Travelling." The least formal is called the Sou-bai or Sou-kouro. In this pattern the Gou are omitted, and only the kiki-suji (listening line) is marked. Sou means "Draft" or "Grass"
After making the pattern use the metal chopstick to make a hole or vent down to the charcoal. This allows the most heat to rise at the center where you will place the mica plate (silver leaf) and center the incense (koh).